I don’t find myself watching TV very regularly these days thanks to the range of on demand services available to me. I watch things online because it allows me to control when I watch something and with a cunning use of Internet plugins, I can totally do away with any insufferable advertising. But whenever I do have the displeasure of watching something live on the tellybox, I can only come to one conclusion. This country has a gambling problem. It seems that every ad break has some form of betting company trying to tell us how flipping amazing they are and why we should give them our money. I can just about understand people betting on the outcome of matches, as there has always been this kind of gambling in our society. But now you can bet on literally everything. Who will score first, last or score at all, who gets booked first, how many bookings, how many corners, the minute a goal is scored in, how many people John Terry will racially abuse in a five minute window, how many times an overpaid asshat will dive and how many rolls on the ground he will achieve to convince the referee that his leg just broke so hard that it ended up in another dimension. There is betting for fun and then there is betting to satisfy an addiction. The only reason these betting companies exist is because in the end, they will win. That being said, I’m not sure how so many big betting companies can exist in such an overly saturated market. Yesterday I was walking through town and realized that I was passing a William Hill shop that was directly next to a Paddy Power shop that was directly opposite a Ladbrokes shop. Not to mention the Coral and Mark Jarvis dens of woe further along the road. Ironically you don’t even need exercise to reach these places to bet on sport, as they are all available at your fingertips on a place called the Interweb. In fact, there are even more available online to add further saturation to the market. When it was first announced that England was going to start having casinos built throughout the country, I thought, “how ruddy exciting”. I was half expecting the glamour of Vegas to be visiting our high streets. But I was wrong. I visited one of these ‘trendy’ establishments, spent nothing, had a free drink and vowed to never return. T’was a silly place filled with desperate people. I don’t mind if people want to waste their money gambling if they enjoy it, as I’m sure they understand only about 5% of all gamblers will leave in profit. Some people genuinely do it for fun. But what I cannot abide are these incessant adverts every time I turn on the TV. I can appreciate clever advertising and the first time I saw the weird shouty Italian guy assaulting Chris Kamara in the shower shouting “Shampoo no, FOOTBALL NOWWWW”, I admit I laughed. But the 783rd time I saw the 15th iteration of that advert this week; I am no longer in such a jolly mood. However there is one advert that makes my blood boil above all others. One that makes me shout at the TV in an effort to interact with it in rage. An advert where I half expect to be called a slag at any point. 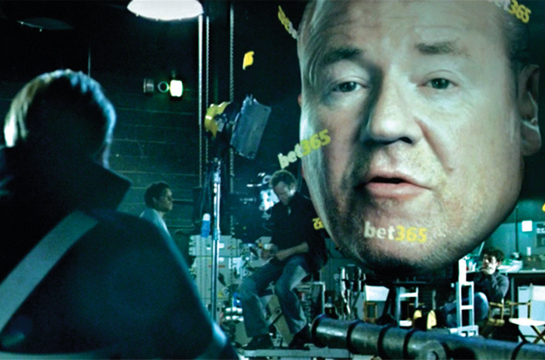 Of course, I refer to the Ray Winstone Bet365 adverts. Adverts so ineffective that I had to Google what betting company they were for. You may think the above dialogue is exaggerated, but it’s not. These betting adverts agitate me as much as that pathetic McDonalds advert where the “nah y’alight” mop headed git sells his loyalty for sodding Happy Meal. 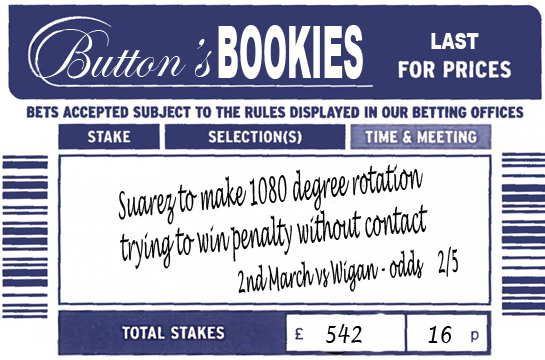 I like Ray as an actor, but these constant betting adverts really drive home the issue. This is a marketplace where endless gambling shops, casinos and flipping Wonga.com with their 62,437% APR can thrive and the only the single major music retailer HMV can fail. England, you have a problem.